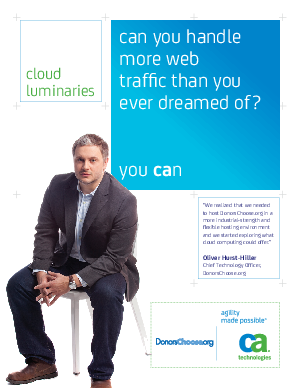 > Research Library > CA Technologies > Can you handle more web traffic than you ever dreamed of? Cloud Luminaries are cloud service providers who are showing enterprises and SMBs the way to realize value from cloud computing, and showing other MSPs how they can build margin by offering a range of cloud-based services. In this executive Q&A, Cloud Luminary and DonorsChoose.org CTO Oliver Hurst-Hiller discusses the importance of being able to seamlessly and quickly switch to a cloud service, the benefits of having all aspects of your company moved to the cloud, and more.